As we continue to dig ourselves out of lovely Boris the Blizzard, my mind is filled with thoughts of the upcoming liturgical season of Lent. Yes. My job as a liturgist really has invaded every aspect of my life. Living the liturgical year is serious business my friends. In my liturgist world preparation begins early in the summer with a discussion of what the pastor wants to do as far as making materials available to our parishioners (i.e. The Lenten Magnificat, or other materials), then there is a penance service to plan, a parish mission and finally we tackle The Triduum. One thing at a time. What do I do for my personal Lenten Study? Well typically I do two things. I have really enjoyed the Blessed is She studies as well as Nell’s @WholeParenting. They are short and make me think. But I like to mix things up and I get bored very easily. 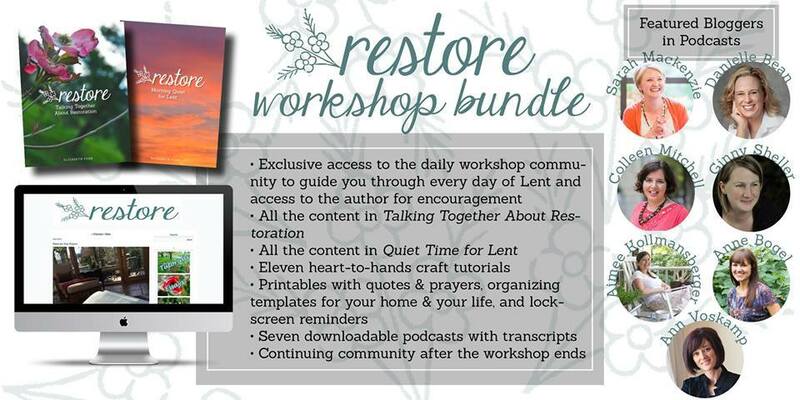 So this year I am really looking forward to Elizabeth Foss’s “Restore: A Lenten Journey to Restore the Hearts of Women“ I don’t know about you but I need a little rest and restoration at this point. I started a new job, survived the Christmas season in this new job and have come through the first anniversary of Courtney’s death, survived my husband and son starting new jobs, had a car accident, survived my husband having one as well, and we have come thorugh Boris the Blizzard. I am tired. I need to make some changes in my daily routine for my health and my sanity. Most importantly though, I need to continue to enter into that sacred conversation with my God. The more I pray and read scripture and listen to his prompting, the closer we become. If I am willing to spend so much time building up human relationships than shouldn’t I spend even more time with My Savior. Elizabeth has a way with words. It’s her gift. It’s part of her vocation to softly sit, listen and encourage women in their journey’s. I look forward to walking this Lenten journey with her and some of her good friends. A few you know well since I have shared their goodness here many times. Ann, Ginny, Colleen, Danielle, Aimee, Sarah and Anne are joining in on the fun with Elizabeth to provide a wonderful, gentle and productive Lenten journey. I am so looking forward to this. I really am. I want you to join in the fun with me if you can. I know, I know, money is tight for many of us, myself included. It is well worth it I promise. If you can’t take advantage of the full bundle with printables, e-books and podcasts for $49 not to worry, Elizabeth has made a bargain bundle available for only $15 with two e-books, two printables and two awesome podcasts. Y’all really don’t want to miss this. This is my very first time doing anything with an affiliate link but this is something I feel very strongly about so I am happy to be a part of Elizabeth’s efforts to help women everywhere. 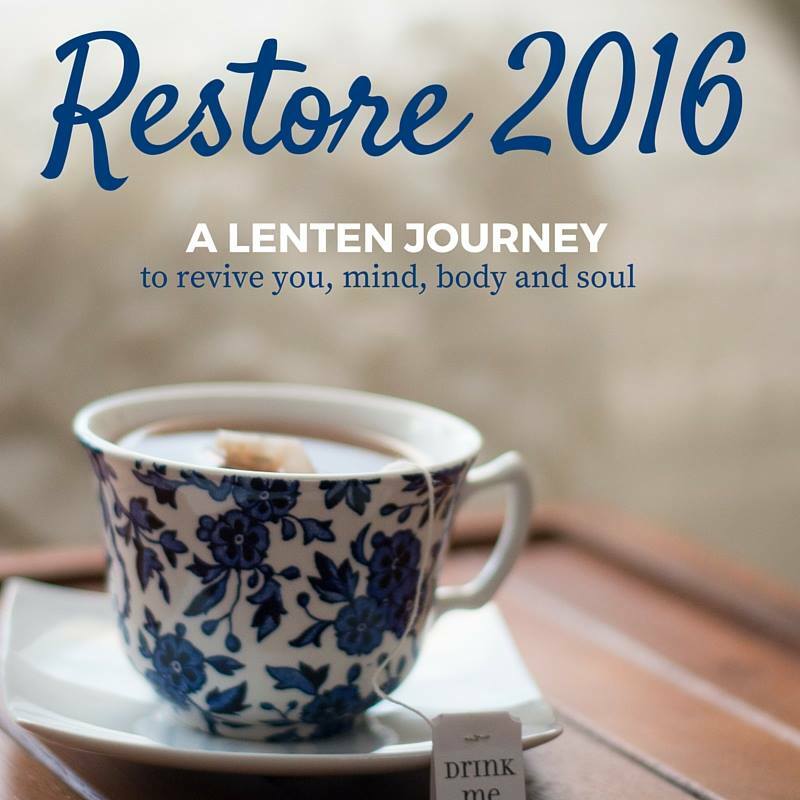 So if you are looking for a little more interactive lenten study, join me with “Restore: A Lenten Journey to Restore the Hearts of Women“. You will not be disappointed. Just follow the links at the bottom of each photo to register. I LOVE Restore! So glad you're joining us, mary! I am so looking forward to it Emily. Do you know if Restore is a Catholic Lenten program? It looks like some of the authors maybe are not? Hi Ali! It is a Christian program with each podcaster discussing their individual journeys. Elizabeth has written most of the content so I can say with confidence that part is wholly Catholic.